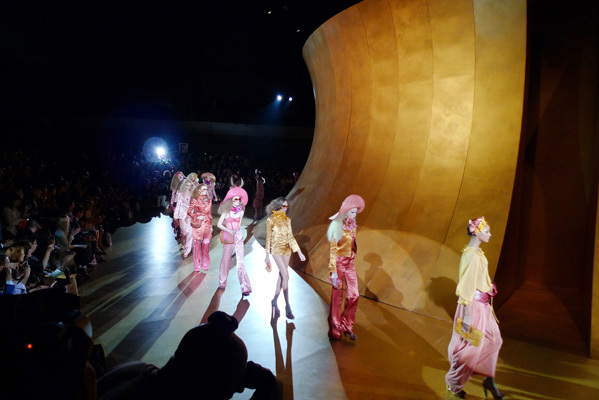 Marc Jacobs’ fashion shows have changed a lot in the last few years. They used to start 3 hours late and Monday night it appeared Marc and his crew was too early. Half an hour before the show his team Tweeted ‘Marc’s ready now. Were waiting for editors.’ Eventually the show started exactly one time, which led to Courtney Love watching only the tail end of the show. With Vivaldi’s ‘Summer’ coming from the speakers Marc’s first models entered the catwalk. After only one look we could tell what Marc’s inspiration was. His seventies-theme was visible in every little detail. There were easy breezy dresses, blouses and jumpsuits all, of course, in the right seventies shades (burgundy, amber, coral pink, Byzantine, bright maroon). The busy prints from that era were present too, as well as the flared pants, which we saw on a jumpsuit and a metallic pair of pants. The shorts were tiny and the slits were high. Lots of fabrics were sheer ones and the pants were high waisted. The make-up was perfect for the show. The models had bleached eyebrows, shiny eyelids (from lots of Vaseline) and matte, stained lips. Their hair was all frizzy and often decorated by an enormous flower. Those flowers (which were actually lily’s) popped up everywhere in the show. Around the models’ necks and waists and on the collars of their clothes. Large hats, round sunglasses en small bags and clutches completed the looks. Ps. It was rumoured that the show area is also the backdrop of the spring/summer campaign. Marc Jacobs might have show the campaign in tandem with the show.